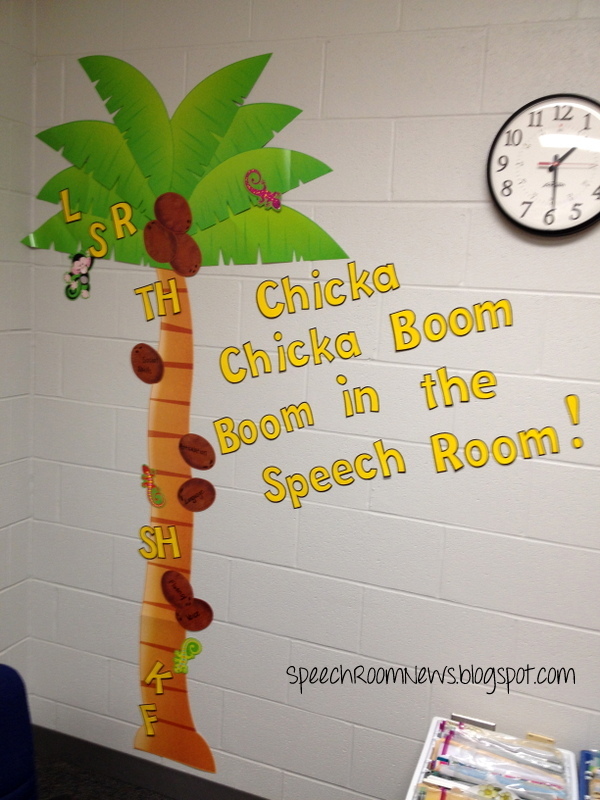 Chicka Chicka Boom Boom, Welcome to My Speech Room! Wait, it’s mid August already? Wait, school starts on Monday? Although I can’t quite believe it… it’s Back To School time! 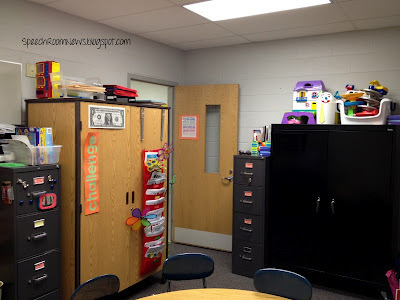 I thought I’d show you my room and give you a freebie to get things started off on the right foot! 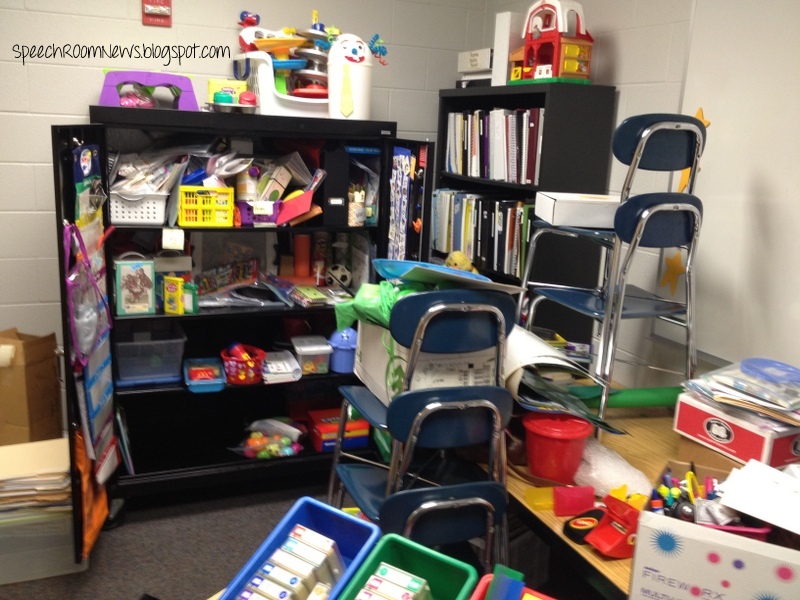 I went into my school a few times this week to work on getting myself organized! When I showed up I got some super news… I get my room all to myself this year! I’ll miss my friend, but am SO excited to have the whole space. So my week started a little like this… ….unpacking everything! 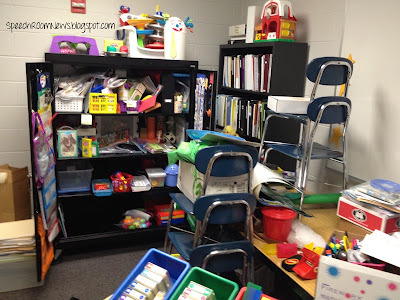 We have to have everything packed so that the custodians can move it out to clean over the summer. So with the help of my amazing custodians and secretary I moved out my friends desk and swapped my table for a kidney table. A little arranging and voila! 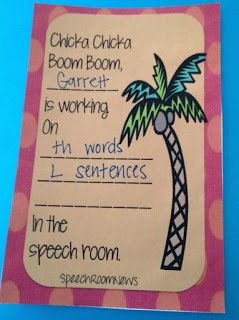 I’m doing a Chicka Chicka Boom Boom theme to start us off this year. 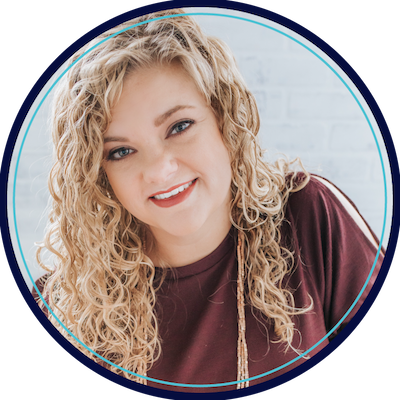 I had loads of inspiration from other speech therapists including Liz, Dina, Brea, Cindy and Kristina. 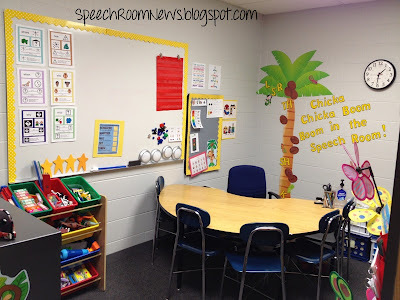 I added my Chicka Chicka Tree and yellow letters saying “Chicka Chicka Boom Boom in the Speech Room.” I also added some of my most common artic sounds to the tree! Will there be enough room?! My coconuts have areas of speech treatment on them. My groups and I always have a conversation about all the things we work on in speech. 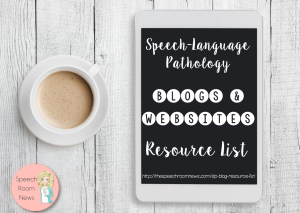 This especially helps those who aren’t working on their ‘speech’ explain that I also help with fluency, language, etc. This my the view from sitting behind the kidney table. On our first day back I plan to have my kids fill out this sheet. We will talk about what they are working on in speech. 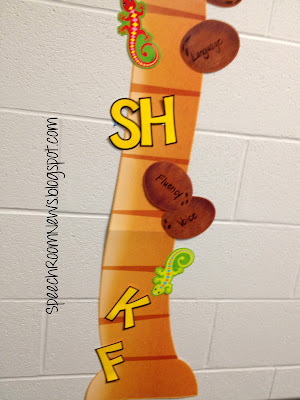 For the articulation students we can tie in the talk about letters/sounds from the book. We will tape these sheet to the wall for a bit. At the beginning of each session, I’ll ask the students: “Chicka Chicka Boom Boom, What are you practicing in the speech room?” Once they can independently verbalize that their goals are I will send the sheets home. 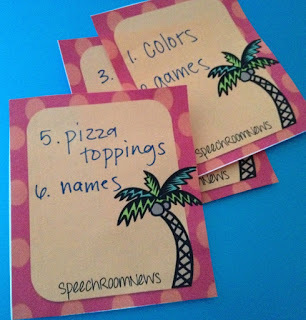 I also made some blank Chicka Chicka Boom Boom therapy cards. I left them blank so you can add whatever learning targets you want to them! I wrote categories on my set to review with one of my groups! Try this video on your iPad for a little fun too! Download the FREEBIES right here :) Chicka Chicka Boom Boom, How are you decorating YOUR speech room? I love it! Where did you get your coconut tree? I got it at Lakeshore! The tree is SO cute! Love, Love, Love it Jenna. You are so creative. I was wondering what your posters were of that are on the white board if you wouldn’t mind sharing? Thanks again for all you do and give. Congrats on getting the room to yourself! So exciting! I have to share this year after having had my own space for 3 years. Where did you get your pocket charts? I got it on Oriental Trader last year. Got another one at Michael’s this year. They also sell it at lakeshore! This is so great! I just bought that same palm tree from Lakeshore yesterday, planning to have the theme “Chicka Chicka Boom Boom, Why do you come to the speech room?” and needed some handouts! These will be perfect! Thank you!! THis is awesome! I just put this all together today. 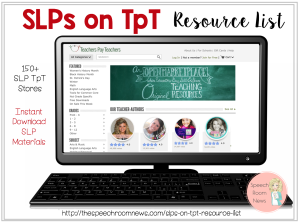 You are a lifesavor for this non creative SLP!! I loved the Chicka Chicka Boom theme so much I thought I would replicate. I printed up some additonal pix of big coconuts and wrote definitions down for cause/effect, prediction etc. etc. and waited for the tree. Well I start therapy next week and IT”S STILL NOT HERE! So…. I am leaving the blank space with the words “what will Mrs. Koffman put here” and I will have a picture of an island and a real coconut (that we will break, taste, describe etc) and I’ll see which grade can GUESS what will be there hopefully next week! I looked on Lakeshore and I don’t see the tree! Anyone know where else to get one? Here’s the link to buy on Amazon!